Brandon Blackmoor ran a game of Bulletproof Blues at CoveCon at Lake Monicello, Virginia on Saturday. By all account, the game was well-received and the players had fun (and that’s what’s most important). 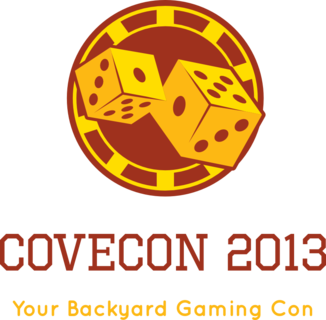 Thanks to Craig Girard for organizing CoveCon and inviting us down to run a game. As a result of some feedback, particularly from gaming veteran Sean Patrick Fannon, we are making some minor changes in Bulletproof Blues. The first problem is that the “trip” action is supposed to represent a range of actions, including aikido and judo throws, pro wrestling slams, legsweeps, and simple Three Stooges style trips, but we did not convey that adequately in the text. To help make this clearer, we are changing the name from “trip” to “slam” (a term in common use in the field of pro wrestling), and we are expanding the description a bit. Of course, we already have an effect called “slam”, which is one possible result of an extreme success in combat. We are changing the name of that to “smash”. Here is the new text for “Slamming”, which replaces the old section, “Trip Attacks”. A slam or takedown involves using a target’s mass and velocity against them so that they fall to the ground. Slams are only effective against targets whose feet are on the ground to begin with. A slam can represent a an aikido throw, a leg sweep, a judo hip toss, or even tripping someone with an umbrella, depending on the attacker’s fighting style. A slam requires a Prowess task roll against the Prowess of the intended target. If the slam attack is successful, the defender falls to the ground and may be injured by the impact. The damage rating of this attack is normally equal to the attacker’s rank in Agility. Characters with human level Agility (rank 3 or less) inflict stunning damage with their throws. A character with rank 3 Agility would have damage rating 3, and any damage inflicted would be temporary. See Stunning for more details. If the defender was moving, the damage rating of this attack is equal to the defender’s rank in their movement power or the attacker’s rank in Agility, whichever is greater. If the defender’s rank in their movement power is 3 or less, the slam inflicts stunning damage. Another small change is in the coordinated attacks action. We are changing the task roll requirements so that the characters attempting to assist with the attack need to make a challenging task roll (task difficulty 12) rather than attempt to actually hit the target. Here is the new text for “Coordinating Attacks”. Multiple characters can work together to increase their chances of hitting an opponent. One character will actually make the attack, and the rest of the characters will attempt to assist them. Each character wishing to assist with the attack attempts a challenging task roll (task difficulty 12) using the appropriate attribute (usually Prowess or Accuracy). Each successful task roll increases the attack bonus of the attack by +1, up to a maximum of +3. The character who actually rolls to hit the target provides the base damage (or effect) for the coordinated attack. If the character who actually rolls to hit the target fails their task roll, the entire coordinated attack fails. We have also made a tiny change to the “distract” action, granting a bonus to the next attack against the target, regardless of who makes that attack. These changes have been made to the PDF on DriveThruRPG, and the update is free to anyone who has purchased it. The changes will be made to the print version as soon as we get the print proof of the revised book. Until then, we are making the print book unavailable to keep anyone from buying the current version. If you bought the current print version and would like to buy the updated version when it’s released, let us know and tell us what email address you used to order the book, and we will send you a coupon for $5 off the price of the book. This section was inadvertently omitted in the initial print versions of Bulletproof Blues. It pertains to using Experience Points to improve your character. Unlike most roleplaying games, Bulletproof Blues assumes that the player characters are relatively complete when they are created. 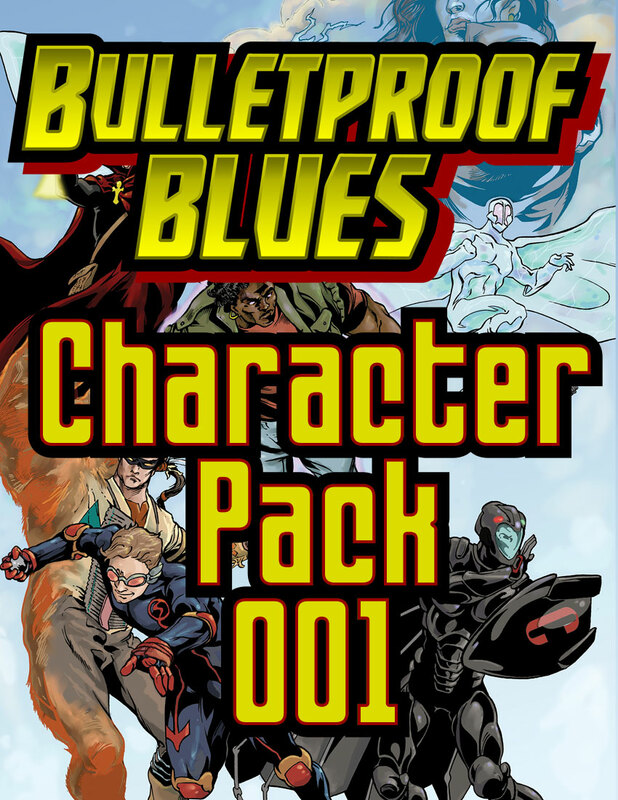 In the comics which Bulletproof Blues seeks to emulate, characters don’t grow ever more powerful as time goes on, as is common in some roleplaying games. However, part of the fun of a roleplaying game is developing new skills and powers, so Bulletproof Blues uses the concept of “experience points”, but the increase in power over time is relatively slow compared to most other games. At the end of each story arc (every half-dozen game sessions or so), the GM determines how many experience points to grant each player, and each player adds that amount to the “Unspent Experience” on the character sheet of the character they played during that story. If they played more than one character (due to plot requirements, death or incapacitation of the first character, or any other reason), the player can pick which character receives the experience points. If the player receives more than one experience point and played more than one character over the course of the story arc, they can distribute those experience points among the eligible characters as the player sees fit. Experience points may be spent at any time to improve or modify a character’s attributes, skills, advantages, or powers. Each experience point is used just like the character points used to create a character: one experience point can improve an attribute or power by one rank, buy expertise in a skill, and so on. The GM should keep a close eye on any new powers the character gains, as well as on any increases in the character’s attribute or power ranks that might make the character unsuitable for the power level of the game being run. It’s never a bad idea for the players and the GM to discuss how the players plan to spend their experience points. The GM should award experience points to players who role-played exceptionally well and made the game more fun for everyone. Here are a few suggestions. We suggest that only one player in the group receive the “Role-played exceptionally” award and that only one player in the group receive the “Was clever and inventive” award, and that these should be two different players. You might like to have the players vote for who they think should receive these two awards. If so, encourage them not to vote for the same two people every time. Also, remember that the purpose of the game is to have fun playing, not to rack up the highest score. If it rubs your players the wrong way to receive different amounts of experience points, it may be easier to just give each player two experience points at the end of each story arc and be done with it. 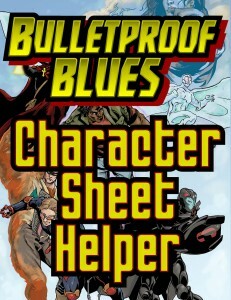 This is a relatively minor update to the Bulletproof Blues Character Sheet Helper. The main change is that we fixed the print size for the Print Sheet tab. If you have any questions, please ask on the Kalos Comics mailing list. The third time’s the charm! After reviewing and rejecting two proofs, we have a version of Bulletproof Blues suitable for printing. If you buy the print version and the PDF together, the PDF costs just one cent above the cost of the print version. If you’ve already purchased the PDF version, check your mailbox — we’ve sent you a coupon for $4 off the print version. Brandon Blackmoor had a conference yesterday with Joe Bardales and Jon Gibbons, two of the creators working on Extreme Earth, a dystopian superhero setting. Extreme Earth will support a number of game systems, and Bulletproof Blues is one of those systems. Pretty cool, eh? Joe and Jon talked about the Extreme Earth setting, and the three authors discussed how Bulletproof Blues could be adapted to it. For instance, the power level of Extreme Earth is quite a bit lower than a typical Bulletproof Blues game, and some powers, like Amazing Movement (which allows the character to travel in space or through time), wouldn’t be available at all. However, the basic premises of Extreme Earth are quite similar to those of the Kalos Universe, if a bit grimmer. Think of Extreme Earth as a cross between Heroes and The Wild Geese. We think using Bulletproof Blues with Extreme Earth will be a great match! Extreme Earth doesn’t have a web site yet, but they do have a Facebook Page and a Google+ Community. Check it out!